Back home in rainy Heidelberg since Monday morning. Sunday 13th – which had looked good for the first springtide swimmers – had only 2 swims, as the weather forecast was for windforce 6 in the afternoon and storms for the next week. And only one of them made it. Eddie, my pilot, also decided not to go out, and the Irish relay team we met at Varne Ridge must have been so disappointed, like everyone else waiting. Some swimmers had already gotten ready to start their swim early in the morning when it was cancelled last minute. From the ferry at 11 p.m., however, the water looked so calm all the way – it was hard to believe that Monday 7th had been the only real swim day for the whole time I was in Dover. I had gotten in two very good training swims on Saturday and Sunday just before I boarded the Euroline bus back to Heidelberg. 5 hours in very wavy but sunny conditions, with an absolute washing machine near the “wall” at the Eastern Docks on Saturday, and 6 hours on Sunday in calm but colder conditions (air 14 to 15°C, water around 17°C), with rain showers, which always gives me extra joy and an extra peaceful feeling when swimming. It is interesting how you get “into” the swimming on a deeper level only after a couple of hours – so all these longer training swims are just a small taste of the “big one”. 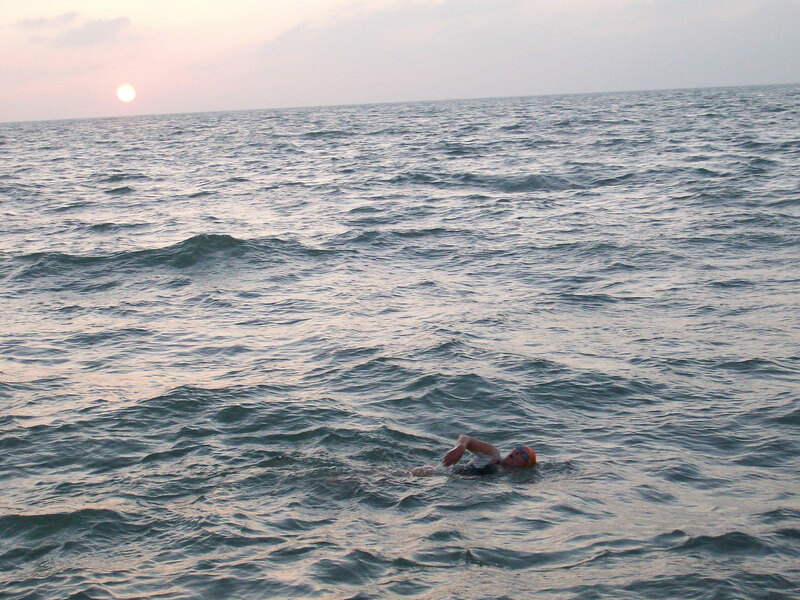 It was great to swim along with other swimmers for company, some of them – like Cliff Golding – had been waiting since July for a weather window! The beach crew, with Emma, Freda, Pat etc. are so amazing, they held out for us last two 6 hour swimmers in the rain and cold – thank you so much for all the support! I felt so ready to go – but it was not to be. Who knows what it is good for. Next weekend looks like very calm weather, the high pressure zone is coming up big, so at least these swimmers will get a chance (and the pilots have an income!). But I am not convinced anymore I will go back for the next tide – time and money just add up. However, I am totally inspired now to continue training seriously for Dover-Heidelberg in 2017 – when I will be 60. That would be real self-transcendence again. Thank you everyone for your support, inner and outer, for your prayers, messages, concern and oneness! It felt amazing and I am sure it was a very good thing we were back in Dover as a team!